The hero Georges Ibrahim Abdallah, a pro-Palestinian Lebanese leftist who has spent 28 years in French prison, was supposed to be freed on Monday and expelled from France to Lebanon. Georges joined the Popular Front for the Liberation ofPalestine in the 1960s, before joining the Lebanese Armed Revolutionary Factions. He was jailed because he was a true human, a true revolutionary who dedicated his life fighting injustice. He had a great faith in the just cause of Palestine. He sacrificed 28 years of his prime for the sake of the Palestinian people’s justice and freedom. The Palestinian people are excitingly waiting for his release. This photo was taken in Jerusalem in front of the French Consulte today. 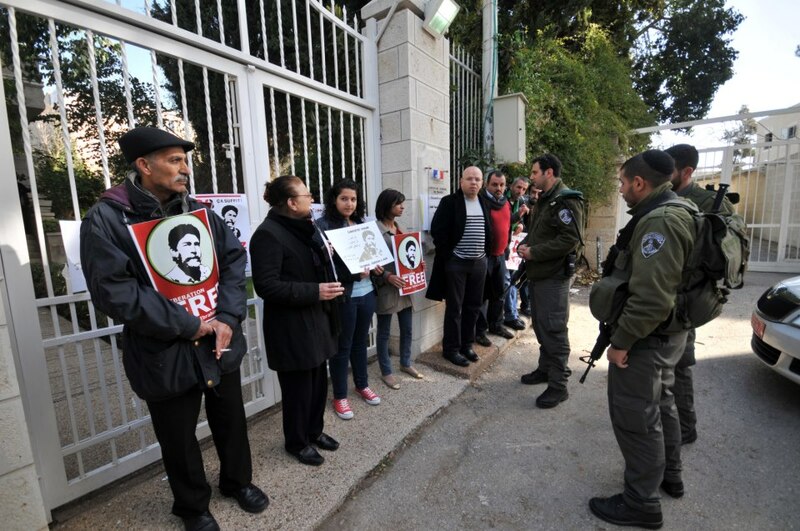 Palestinian people organized a sit-in and held Georges’ photos calling for his release. They aimed to express their anger at the delay of Geroges’ release and their disapproval of the fasciest French policies. Freedom for George Abdallah!